Chaitra Navratri Mela is an important annual festival and fair held during Chaitra Navratri at the world famous famous Vaishno Devi Temple at Katra, Jammu, India. Chaitra Navratri Festival At Vaishno Devi Temple is from April 6 to April 14, 2019. The most important dates of the Mela are from April 12, 2019 – Durga Ashtami day. 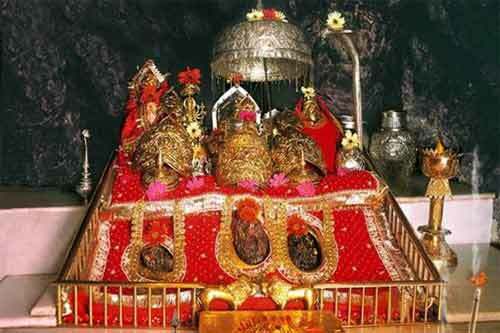 Goddess Vaishno Devi is an important incarnation of Goddess Shakti and in this form she is very popular in India. Millions of devotees arrive at the Vaishno Devi cave shrine to worship Maa Vaishno Devi during Chaitra Navratri. Special decorations and pujas take place during the nine days. Chaitra Navratri is of great importance in the Himalayan regions. It is believed that the original Navratri was held during the March – April period. It was Bhagavan Sri Ram who invoked Goddess Durga in September – October period to get her blessing in the battle against Ravana in the Ramayana. Vaishno Devi temple is one of the most popular pilgrimages in India and this holy shrine dedicated to Mother Goddess is situated in a cave in the Trikuta mountain in Jammu and Kashmir. Perched at an altitude of 5200 feet, it involves a trek of nearly 12 km from the base camp at Katra. The period of Chaitra Navratri witnesses heavy rush at the shrine.